Tuco the Japanese Mastiff mix may be a supermodel on the rise, but his life hasn’t always been glitz and glamour. Tuco’s wags-to-riches story began in Texas at Arlington's Animal Services Center after he was found nearby, wandering the streets neglected and underweight. "He was about 40 or 50 pounds, just skin and bones from the pictures they sent me," said Clay Hayner, who adopted Tuco last year. "You could see every bone on him." Shelter staffers had a soft spot for Tuco, who was known for carrying his bowl around in his mouth and getting visitors to fill it with food, water and treats. After gaining some weight and recovering, Tuco was ready to be adopted. Hayner, a professional photographer, went to the shelter in March 2017 looking for a four-legged companion, but it was Tuco who picked his two-legged comrade to take him home. "He jumped up, gave me a big hug and he was like, 'Take me home.' I was like, 'You're the one,” said Hayner. "It just clicked. He knew what he was doing." Tuco quickly became a focus in Hayner's photography. "He's so easy going. He just sits there, he lets me decorate him, dress him up," Hayner said. 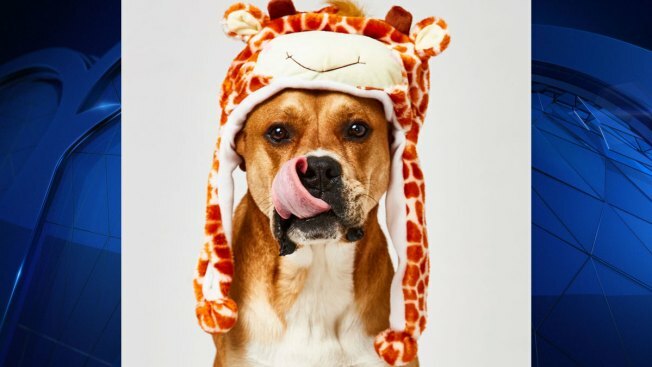 From a spider monkey Halloween costume to sporting hiking gear in New Mexico, and any number of hats that Tuco is able to endure, the camera seems to love the expressive pooch. "He just lets me do whatever to him. So, anytime you get dogs in a shot — it just makes it better," Hayner said. And advertisers agree. Tuco has been hired to model in photo shoots for clothing companies, lighting and ceiling fans, and even Hari Mari flip flops. He will also soon be gracing the posters for Purina dog food. That modeling job came with an added bonus: extra bowls and dog food, which Hayner and Tuco decided to donate to Arlington's animal shelter. Hayner said Tuco still carries his bowl around, “for attention” and treats. The charismatic dog has a big social media following. His Instagram account @adventure_of_Tuco, which showcases Tuco "living his best life ever," has made him insta-famous. Hayner said while he has given Tuco a new lease on life, the pooch has returned the favor in an even greater way, "unconditional love." And Tuco isn’t Hayner’s only doggie model, the photographer also donates his time to shelters, taking pictures of pets in need of forever homes to help get them adopted.